Rhode Island Comic Con 2017 is just three short weeks away and the guest list is being finalized after eight months of edge-of-your-seat, hold-your-breath, traffic-stopping announcements, day after day and week after week. First, we saw Power Ranger Week and Hero Week in the early part of the year, then we celebrated Walker Week and Music Week right before the summer, and we finished off with Star Trek Week, Star Wars Week and Voice Actor Week. But which cast reunions rank in the Top 5 for this year’s Rhode Island Comic Con? The popular Netflix series "Marvel’s Luke Cage" makes an impressive presentation this year at #RICC2017 with five of its top actors. We begin the roster with Frank Whaley who played Detective Rafael Scarfe in the first six episodes of the series. Also appearing is Jade Wu who plays Connie Lin. 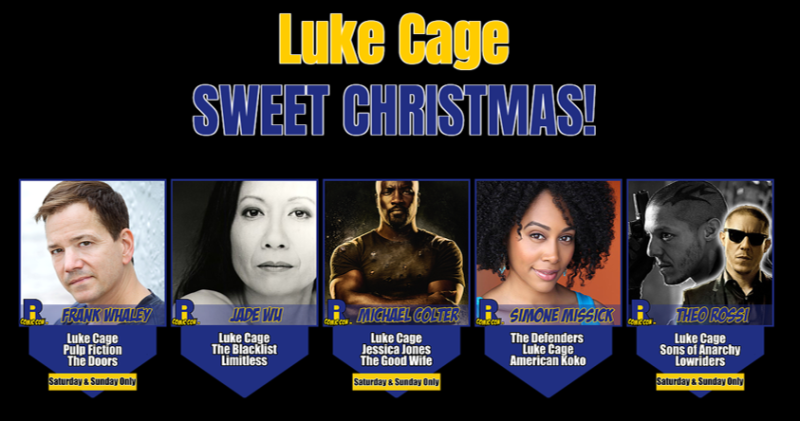 Up next, we have the top three stars of the show, Theo Rossi (Hernan "Shades" Alvarez), Simone Missick (Misty Knight) and Luke Cage himself, Michael Colter. Sweet Christmas! That’s a cast reunion! With seven actors from each of these properties, we have a tie. 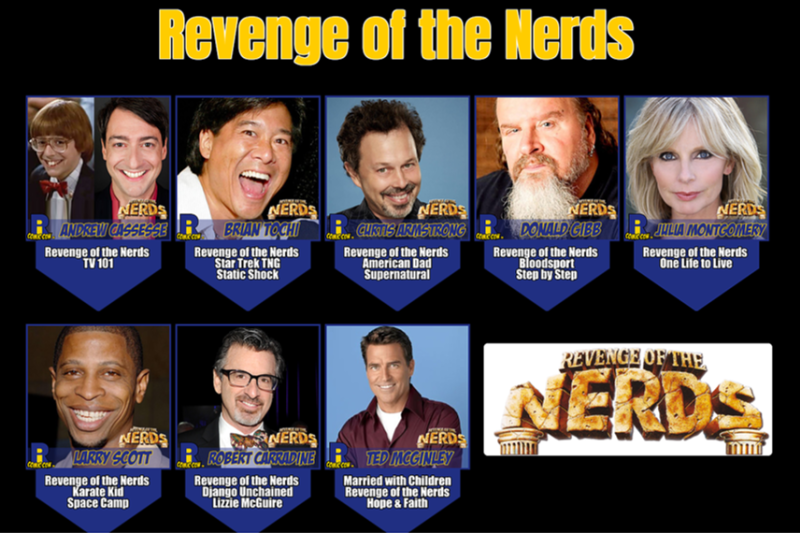 From the cult-classic film "Revenge of the Nerds," Robert Carradine who played Lewis leads the pack, followed by Andrew Cassese (Wormser), Curtis Armstrong (Booger), Larry B. Scott (Lamar), Brian Tochi (Takashi), Julia Montgomery (Betty Childs) and Ted McGinley who played Stan Gable. Rhode Island Comic Con this year brings fans the largest contingency from the "Power Rangers" franchise in the convention’s history. From the "Mighty Morphin Power Rangers" television series, we welcome Jason David Frank (Tommy Oliver), Steve Cardenas (Rocky DeSantos), Catherine Sutherland (Kat Hillard) and Nakia Burrise (Tanya Sloan). From "Power Rangers Turbo," Selwyn Ward, who played T.J. Johnson, and Hilary Shepard, who played Divatox, join the group. And last but not least, from "Power Rangers Time Force," Michael Copon (Lucas Kendall) is coming to the show for the first time! For the first time in Rhode Island Comic Con history, the largest group of actors from the 50-year-old franchise is coming to the show. What’s even better is that almost the entire cast of "Star Trek: The Next Generation" is aboard for the event. Cast members include Jonathan Frakes (Commander Riker), Michael Dorn (Lieutenant Worf), Marina Sirtis (Counselor Deanna Troi), Brent Spiner (Lt. Commander Data) and Gates McFadden (Dr. Beverly Crusher). Now, any “Next Generation” crew needs guidance and direction. At Rhode Island Comic Con, that direction will come from none other than Captain James Tiberius Kirk, William Shatner, from "Star Trek: The Original Series." And from the new generation of "Star Trek: Discovery," we welcome Jason Isaacs who plays Captain Gabriel Lorca. But wait! There’s more! Another crew member of the USS Enterprise-D is coming to Rhode Island Comic Con 2017. Please welcome Denise Crosby, who played the role of Tasha Yar. 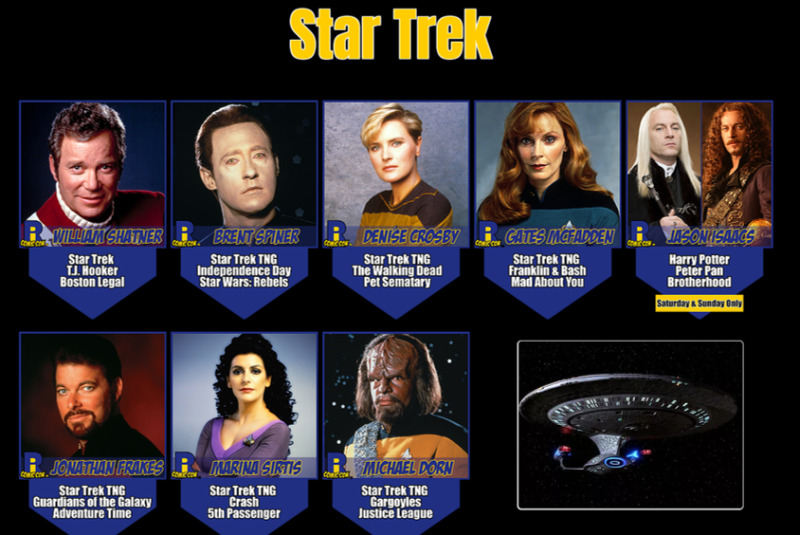 This brings the "Star Trek" representation to an impressive eight actors. No pop culture event is complete nowadays without a huge presence from the AMC hit series "The Walking Dead," and this year’s Rhode Island Comic Con is no exception. With 10 actors scheduled, "The Walking Dead" claims the #2 spot in our list. 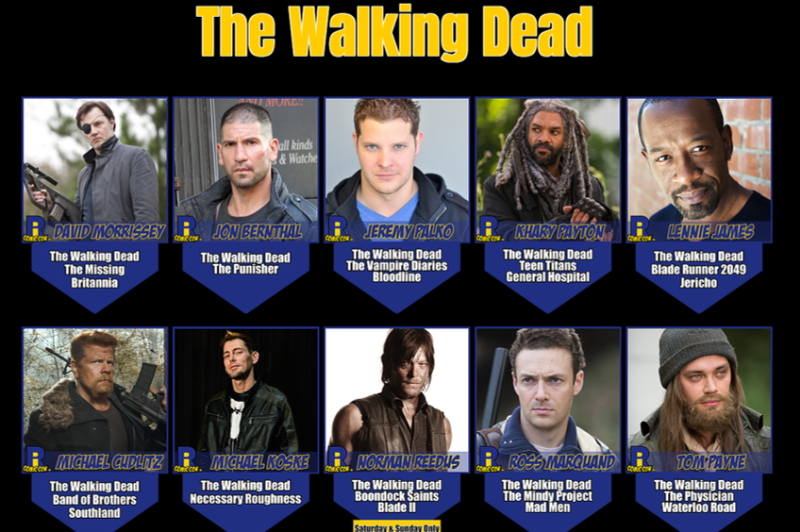 On the docket for this year, fans can meet David Morrissey (The Governor), Jon Bernthal (Shane Walsh), Jeremy Palko (Andy), Khary Payton (Ezekiel), Lennie James (Morgan Jones), Michael Cudlitz (Sgt. Abraham Ford), Michael Koske (Walker), Ross Marquand (Aaron), Tom Payne (Paul "Jesus" Rovia) and Daryl Dixon himself, Norman Reedus, in his first Rhode Island Comic Con appearance. The "Star Wars" franchise spans decades, across multiple platforms and mediums. Rhode Island Comic Con is excited to welcome the following voice actors from "Star Wars: Rebels": Freddie Prinze Jr. (Kanan Jarrus), Steve Blum (Zeb Orrelios), Jason Isaacs (The Inquisitor), Mary Elizabeth McGlynn (Governor Pryce), Brent Spiner (Gall Trayvis) and Paul Reubens (RX-24). From "Star Wars" (Episodes I, II, III, V and VI), Ian McDiarmid for his role as Supreme Chancellor Palpatine. He is joined by "Episode V" castmate Julian Glover in his role as General Veers. And from the newer generation of "Star Wars" films, fans will see Spencer Wilding, the new Darth Vader in "Rogue One," Joonas Suotamo, the new Chewbacca in "A Force Awakens," and in the role of Supreme Leader Snoke, headliner Andy Serkis. 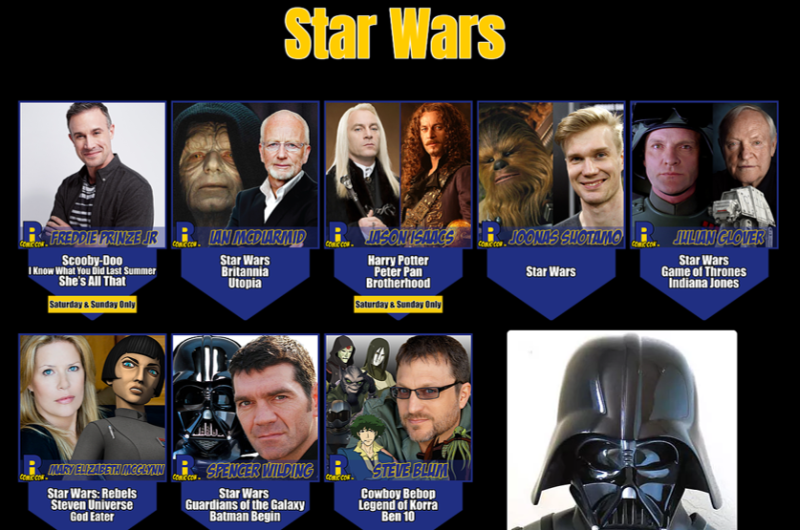 With a count of 11 actors from the franchise, "Star Wars" takes the #1 spot on our list of properties represented at Rhode Island Comic Con 2017! Rhode Island Comic Con converges on the Rhode Island Convention Center, the Dunkin&apos; Donuts Center and the Omni Hotel November 10–12. Tickets are still available through the convention’s website, www.ricomiccon.com, the Dunkin&apos; Donuts Center box office, and all Toy Vault locations. Susan Soares is the press relations manager for Altered Reality Entertainment, LLC, an entertainment event company that produces multimedia, multi-genre events throughout the U.S., including their flagship event Rhode Island Comic Con, ComiCONN “A Show for the Fans by the Fans,” Colorado Springs Comic Con, Terror Con, and the newly announced Empire State Comic Con.